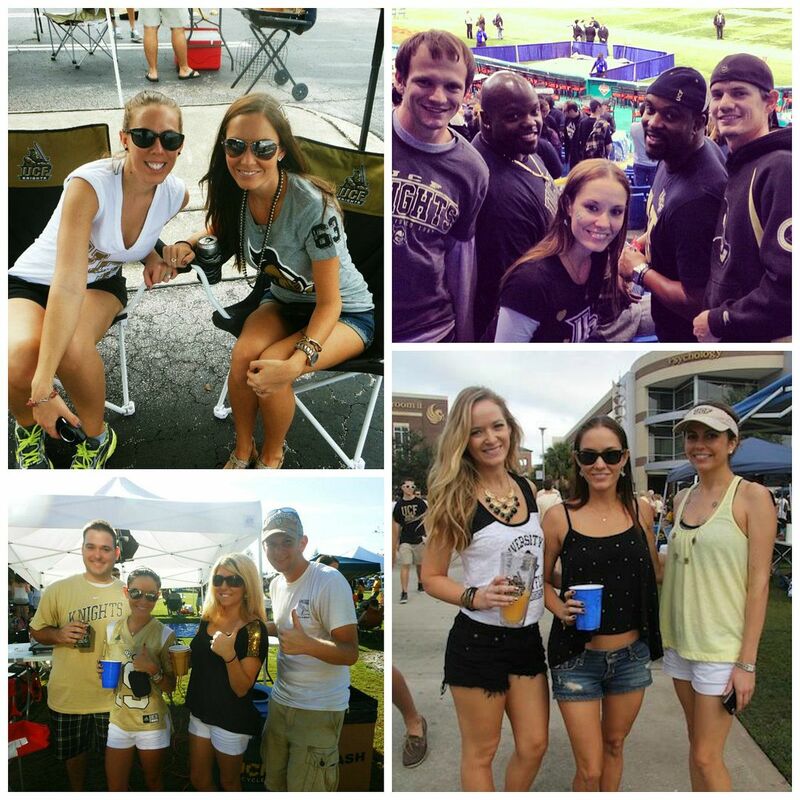 So in honor of football being back I decided this week's link up with Amanda would be dedicated to my favorite UCF football moments! 1. Our first home game in the new stadium. I had already graduated by the time we built a stadium on campus but it was such a blast going to the first home game and having that whole experience. It didn't hurt that we won our game either! This was the ONLY time I ever participated in the tradition of throwing someone up in the air for each number of points you score. It was terrifying. 2. Our first conference championship win! Not even going to lie, this picture was taken in December...and it was pretty hot out. 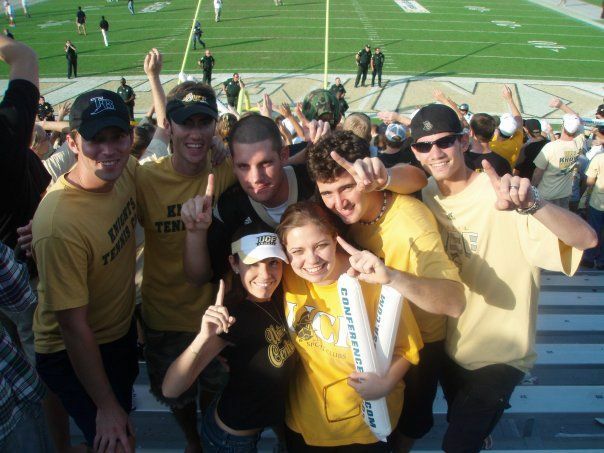 But it was so awesome to be there for UCF's first conference championship win! We're a pretty young school if you haven't figured that out already! 3. This was one of my favorite tailgates we had! Since we were playing Miami and they're only a few hours away it was absolutely packed! We didn't go as all out for this tailgate as we do now but I had so much fun tailgating literally ALL day in the center of all the action. We didn't win the game but it was still a blast! 4. Our first bowl game win! 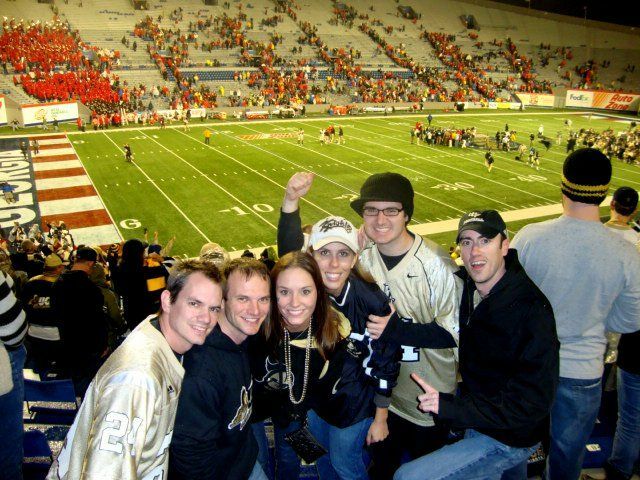 We drove all the way to Memphis, TN to watch UCF play Georgia on New Year's Eve. It was freezing, it was drizzling all day (for those of you who have heard me use the term "car-gating" this is where I coined the term LOL) and literally seconds after this picture was taken it started POURING. But we beat Georgia and had a great night despite the rain! 5. My final favorite UCF football memory... oh who am I kidding. I can't choose just 5! Last season was definitely one of my favorites hands down since we were able to finish the season with only one loss and beat Baylor in the Tostitos Bowl! Instead of picking just one moment I picked a few of my favorite tailgating moments. I absolutely cannot wait for this season to start and I am so ready for the game tomorrow! Do you guys have any football tailgating traditions? Any teams your particularly excited to see this year? Hope everyone has an amazing and safe holiday weekend! Hope your team wins... unless it's Penn State, Arkansas or Navy. Sorry if you cheer for them but I'll be rooting against you this weekend! That picture of you was taken in December?! God, I'm questioning myself as to why I'm still living in Illinois! Lol. Hope you have a nice weekend, enjoy your football!! That first picture is so awesome and I'm sure terrifying! Loveeee college football!! So excited! Great pictures!! Everyone I know is so excited for football. Hope your team wins this weekend! Happy Friday. Oh my, so exciting! that's so cool you were thrown in the air, I love it! yay football season! and football food, yummy! there is SO much going on this weekend in Atl that I'm hiding out in my apt! Looks like you've had a blast! I know this season will be fun too! Happy Weekend, xo! Wow, you're a brave girl to let people throw you in the air for each point. That sounds so scary! football! football! football!!!!!! Good luck with your game bright & early tomorrow AM! 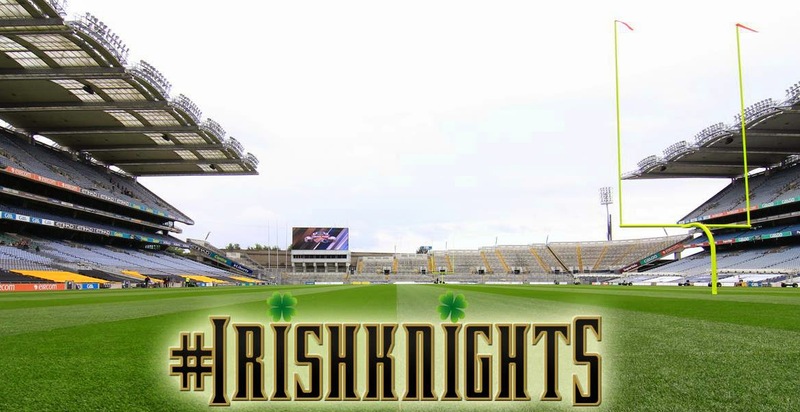 Yesss Go knights!! I'll be watching tomorrow to...Ugh 8am! Ahhh this makes me so excited for football season to start! Tailgating and having watch parties makes it so much fun! After a killer loss for USC (Gamecocks) last night I'm a little less than pumped for football season thus far. Good thing yummy food will help to ease the pain ha. Have so much fun this weekend! Looks like such a great time! We are heading back to Michigan in October to see the UofM versus Indiana game and I am soooo excited! Happy Friday! 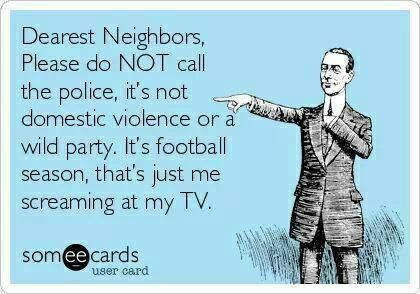 My husband is suuuper excited for the start of college football because it means (a small) reprieve from all of the Bravo that I subject him to - luckily football is my favorite sport so I don't mind too much :) Have a great weekend! Such fun! Looks like you have a crew that all enjoy it, and it looks like such blast! hahaha that ecard is too funny!! I'm glad someone is happy about football season!! Aw, such great pictures! Love football season and game days!! Have fun babe! This was such a cute post! As you know, I'm not a football gal but I totally can appreciate those who are. Have a great weekend, doll! wow, that looks like a lot of fun. I'm a new college football fan because of the bf, but I love the culture of college football that is for sure! Heard how close that UCF game was this weekend. Hahah love that last photo. My college didn't have football and it seems that I've been REALLY missing out. Though that whole tossing you up in the air with the points seems terrifying haha. ESPECIALLY if everyone's drunk. I love this post! Haha this is so me with the Razorbacks! So love your blog!!!! Would you like to follow each other on GFC?! Let me know and follow me on my blog, I will follow you right back on both GFC and Bloglovin! Great photos. Love football myself! looks like you guys have a freaking blast.i would be terrified to do the throwing people up in the air, no thank you. lol.